When a friend found four abandoned flea-ridden, hungry and thirsty kittens 'mewing' in the dumpster of her apartment complex, she called and asked if I would consider adopting a couple of them. At the time, I shared an old duplex on Lower Greenville Avenue in Dallas with a roommate and nursing colleague, Susan. Convincing her of adding furry friends to the household would normally have been problematic except, I recalled witnessing a petrified, ashen-faced Susan standing on a kitchen chair, screaming bloody murder at the sight of a mouse recently. This would be a done deal. 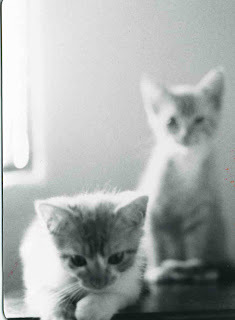 Our new kittens “Waylon” and “Willie” were aptly named during my ‘Country Music” phase. It was 1984 and boot scootin’ (aka C&W dancing) was all the rage. Weekend evenings were spent in cowboy boots and Gloria Vanderbilt designer jeans, with big Texas hair, dancing at “Cowboys”, “Diamond Jim’s” and/or “No Whar But Texas”. I had always thought that Waylon Jennings and Willie Nelson had dubbed themselves “The Red Headed Strangers” but recently learned that they actually were "The Honky-Tonk Cowboys" - whatever. "The Red Headed Strangers" were a nice fit for our boys.